Jan and Dan - the chefs who created our delicious potato pancakes! Campers loved participating in the Kings Day activities! Campers did all kinds of fun activities, such as painting. 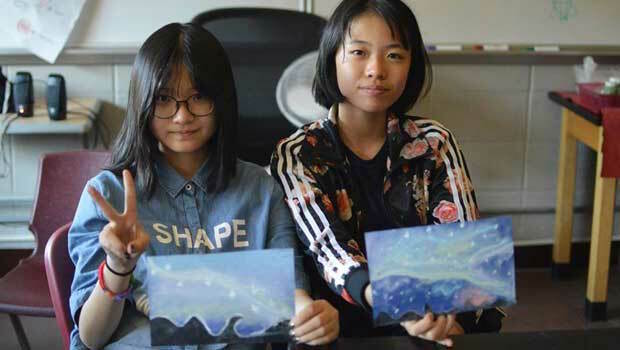 These were inspired by Starry Night. Making crafts was a big part of the day! Here, campers work on a Bolivian craft. Counselors dressed up to represent their home countries. 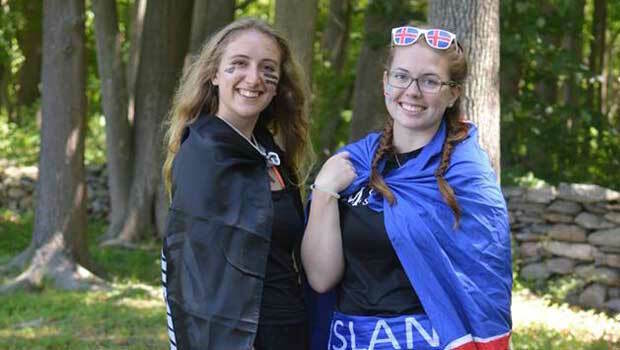 Hrefna represents Iceland, and Shelby represents New Zealand. 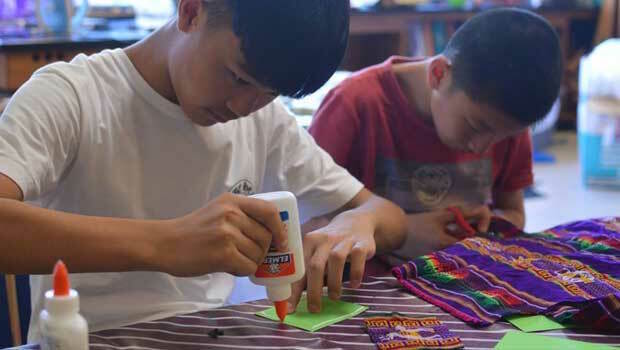 Campers made crafts from around the world! 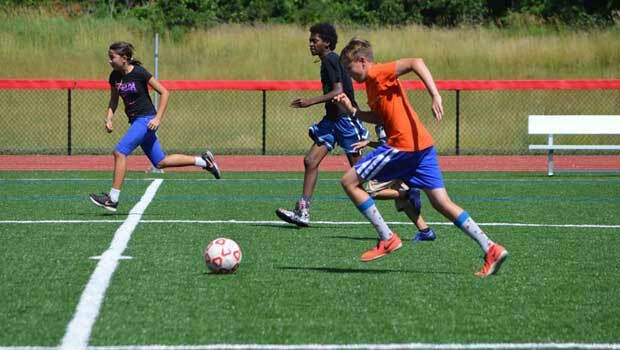 Sports were also a part of the day! International Day: a unique day! International Day is a truly unique day at Camp Stonewall. 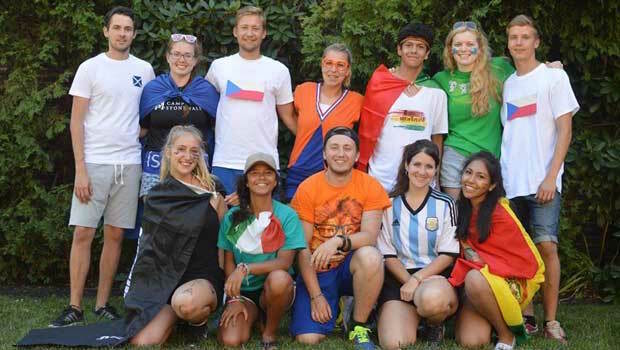 On this special day, which takes place every year, camp counselors from around the world show off their countries and cultures with a day of food, games, and fun. 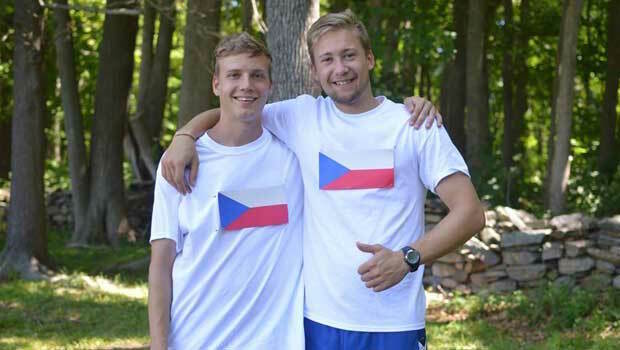 One of the awesome things that camp counselors do is dress up to represent their home countries. Our participants wore flag capes, face paint, temporary tattoos, and colorful clothes! 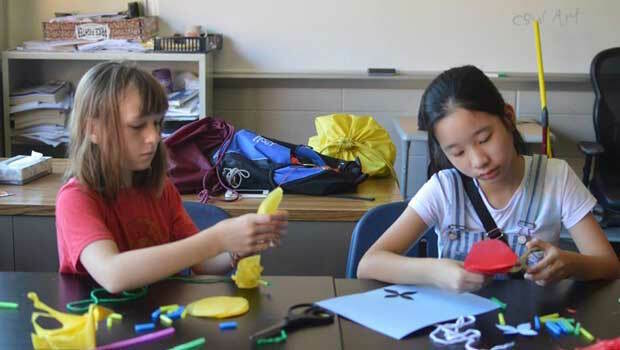 Camp counselors also organized a number of different cultural activities for campers. For example, Dan and Jan, two Czech counselors, made potato pancakes. Jessie from New Zealand made ANZAC biscuits, and two Dutch counselors, Debbie and Dennis, organized some fun and silly Kings Day games. These games had all of the campers laughing and having fun! Dennis from the Netherlands demonstrates The Kings Day sack race. As camp director Emily said, "International counselors have opened the eyes of our campers to how big - and yet small! - the world can be. InterExchange participants have made unfamiliar accents, phrases, sports, recipes, crafts, and dances part of our everyday lives at camp. Each year, we use International Day to introduce more of these amazing cultural differences to our camp community. And every year, kids list it as their favorite event of the Summer!" 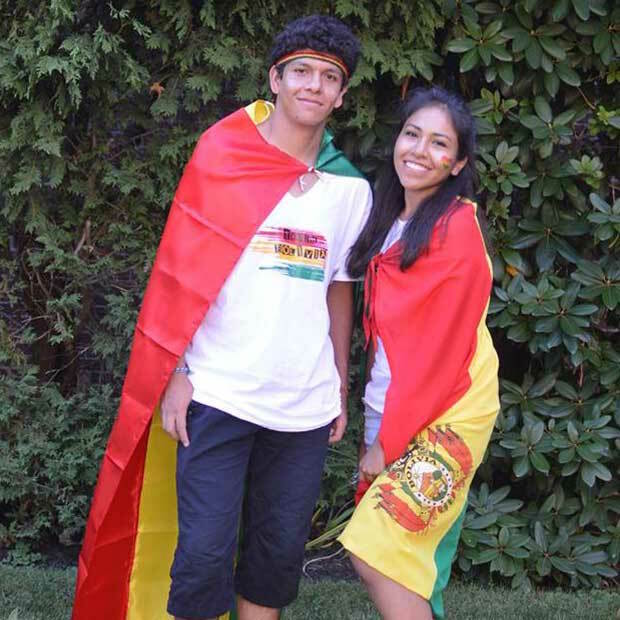 "Each year, we use International Day to introduce more of these amazing cultural differences to our camp community. And every year, kids list it as their favorite event of the Summer!" There may only be one International Day per year, but every day at Camp Stonewall is truly international! Camp Stonewall places a strong focus on bringing a diverse group of international counselors to camp each summer, and has been hosting international counselors since 2012. This year, the camp is hosting 12 participants from 8 different countries through InterExchange. Flags representing the home countries of the participants are hung throughout the camp, and the campers, staff members, and camp Director all brim with excitement about these international counselors. 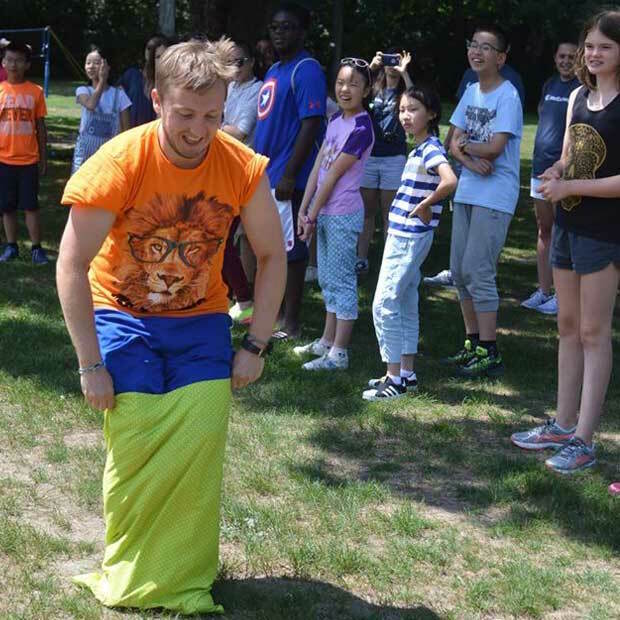 "International counselors have opened the eyes of our campers to how big - and yet small! - the world can be. InterExchange participants have made unfamiliar accents, phrases, sports, recipes, crafts, and dances part of our everyday lives at camp." Camp Stonewall is strong in its commitment to opening up young campers' eyes about the world - and letting participants get to know more about American culture. "I think what our international counselors discover through our kids is a sincere appreciation for American culture and love if its people," explained Emily, Camp Stonewall's Director. "I think what our international counselors discover through our kids is a sincere appreciation for American culture and love if its people." Emily discussed the placement process saying that "no one comes close to the diversity [of participants] that you provide; not even in the same ballpark. I can't imagine any set of circumstances where we'd work with anyone else." 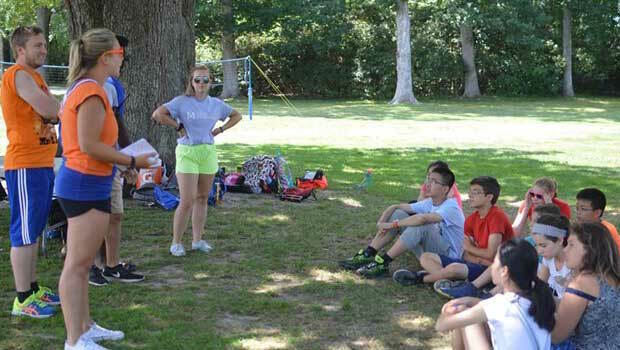 "InterExchange is just quietly being amazing at finding young adults from all around the world to share the camp experience with," she explained. "I feel we truly partner as organizations to spread the value of cultural exchange, and that philosophical alignment has helped us be even more purposeful in choosing, retaining, and maintaining relationships with new and former staff." "I'm such an InterExchange groupie," she told us. "There's a lot of mutual love."